Artist's depiction of a manned Mars mission. Apollo 11 astronaut Buzz Aldrin, the second man to walk on the moon, gives testimony on the future of NASA and American space exploration to the U.S. Senate Subcommittee on Space, Science and Competitiveness on Feb. 24, 2015. "Lunar settlements will only require a small step for the other nations to catch up," he said. Buzz Aldrin, who set foot on the moon just after Neil Armstrong in July 1969, has developed an architecture to establish a Mars colony, with the first manned Red Planet landings envisioned in 2038. He sketched out the basics for the senators. "It's an integrated plan that knits together return[ing] to the moon on a commercial and international basis, leveraging asteroid rendezvous, and settling Mars on a carefully developed risk-mitigation architecture," Aldrin said. 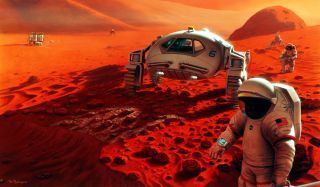 "It includes the use of a robotic cycler between Mars and Earth that will revolutionize the economics and safety aspects of human missions to Mars." Two other former NASA astronauts, Walt Cunningham and Mike Massimino, also spoke to the subcommittee Tuesday, and both were bullish on manned Mars exploration. Indeed, Massimino said the benefits of human missions to Mars would probably be extensive and long-lasting. He cited the many life-improving spinoffs that came out of the Apollo and space shuttle programs, and the likelihood that humanity will need to find a second home in the solar system at some point, to ensure its survival in case something catastrophic should happen here on Earth. "Mars might be that place. So if we decide to go there, it's giving us another option," said Massimino, who flew on two space shuttle missions that serviced NASA's Hubble Space Telescope, in 2002 and 2009. "I really see it as an investment in our future, to inspire our young kids — and also, I think, to help our country and our economy for many years to come," he added. "I think it would be a glorious thing to do." Cunningham, the lunar module pilot on the Apollo 7 mission to Earth orbit in 1968, told the senators that Mars is the next frontier in human spaceflight, and if the United States doesn't lead a Red Planet effort, someone else will. That's too expensive for NASA to pull off at its current budget level, Cunningham said. These days, the space agency gets about a 0.5 percent share of the federal budget, compared to 4.5 percent at the height of the Apollo program. "The budget has got to go up for NASA," Cunningham said. "NASA's budget is way too low to do the things that we talked about doing here this afternoon."